The 2015 Toyota Camry is here, and it is going to be a wild success for Toyota. The customers who buy that new car are going to get exactly what they expect and will tell all their friends. Meanwhile, the reviewers over at the race car magazines are still saying that the Camry is rather boring. These folks need to remember that not everyone who can afford a Dodge Challenger Hellcat actually wants one. I heard a story once from a pal. He had a friend that took occasional vacations to Southeast Asia and would spend a week or two in an opium den. You are interested in what I just wrote because a little part of you finds that exciting. Even still, the chances you are going that route on your next vacation are – nill. You will go where you always go. The lake house, the beach house, or to the old homestead to see relatives and tour the local hot spots with the other tourists. The reason you do that is you want to relax. You want “predictable”, and you know where to get that. I’m just like you. The Camry is the lake house. It will not surprise you. It will relax you. You are about as likely to buy a Camaro ZL-1 for your daily driver as your aunt is to book a skinny-skiing vacation. OK, the vanilla analogy is older than dirt. The Camry is vanilla. More people buy that flavor, and somehow that makes it boring. Commonality is boring is the message. The truth is though, that in its class the other cars are not chocolate, maple walnut, and peach sherbet. They too are all also vanilla. Some are the white vanilla; some are that yellow vanilla, and some are that vanilla my kids won’t eat that has those black “pepper” specs in it. The guys that drive the Hellcat back to back with the Viper and say that the Camry doesn’t stack up are not you, me, and the rest of the neighborhood. They are outliers, and they write about cars as if people want an 11 MPG crossbow bolt to drive the kids to Sunday school. They don’t. They want a comfy cocoon to get them there and back safely, affordably, and reliably. Camry is better at that than any other choice. I would be willing to bet those guys have eaten their share of vanilla too. So, those analogies are pretty “out-there.” Here are the mechanical reasons the Camry wins. It has no turbocharger. Turbo-lag is annoying. The Camry has the geared, automatic transmission you expect, and it feels right. Constantly variable transmissions drone and feel weird on test drives. The car looks OK. Toyota can make a great looking car, but they know that is polarizing. They want 90% of the folks that look at the Camry to know it is a Camry and to think “Yeah, that’s fine.” Companies that make exciting looking cars get rave reviews, and fewer buyers. How Wild and Crazy Can Front Drive Affordable Be? The Camry is front drive which makes the cabin bigger, makes the car less expensive, and in winter is an excellent setup for snowy days since the engine helps push the drive wheels down. However, front drive makes cars understeer (so boring in its predictability and safety), makes them no fun for smokey burnouts, and does not have the panache that fuel-sucking all-wheel drive does. The company that makes Camrys also offers rear wheel drive cars, all-wheel drive cars, and ones that can do awesome burnouts. They sell at about 1/100th volume the FWD Camrys do. 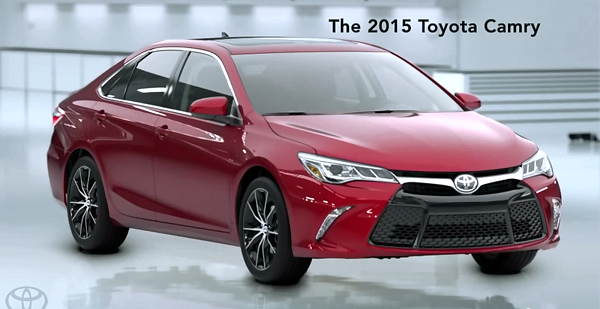 Toyota knows what Camry buyers will buy just like Apple knows what iPhone buyers will buy. End of story. To many, that may seem boring, but remember, Toyota is said to have made some cars that accelerated unexpectedly. That is exciting! Most people were against it. So if you are researching the Camry and a reviewer says it is “boring” keep in mind that his perspective is skewed. Unless you are the type that does plan to sky-dive into Borneo this coming Christmas break and then hike your way out with only a buck-knife and a six-pack of 5-hour energy. You, my friend, would be better-matched with a Hyundai Sonata. Author's note - I drove the 2015 Dodge Hellcat Charger SRT and loved it. I own a Highlander. I love what you're saying! It's exactly why I find the Consumer Reports review videos on Youtube so much more satisfying: they don't start off every car review with the same low perspective burn out and macho rhetorical question. "So if you are researching the Camry and a reviewer says it is “boring” keep in mind that his perspective is skewed." Thanks for mentioning what you personally drive/own - it would be enlightening if all reviewers did. My rides: '80 Camaro Z28, '98 Jeep Grand Cherokee Limited 5.9, 2012 Toyota RAV4 Limited V6 4WD. Wow, a auto writer that actually sees the real world and actual life experiences, refreshing. I want this writer to write all the car comparisons, that way it car reviews would be relevant to normal peoples lives. I own a minivan and a compact sedan. I review cars that are affordable to me as well as cars that literally cost more than my house. Every vehicle has a prospective owner, a market. One of the smallest markets of all is the sports car market. Cars like the Camry sell really well because they're affordable, reliable, and don't rattle any cages. Most new car buyers are over 55, of middle income, and equate "boring" with "realiable." Being boring sells. Toyota has mastered the art of building cars that are not flashy, not particularly fast, and neither over- or under-powered. Hence their success. The bulk of new car buyers aren't after a Porsche, a Corvette, or a "technologically advanced" plug-in. They want a Camry, an F-150, a Murano. Simple, well-known, reliable, and cost-effective. "Hard plastics" aren't a concern, but ugly plastics are. I've been in both low-end and luxury vehicles that have just cheap-looking, horrible plastic. Hard plastic also has reflective qualities that can mean more ambient noise in the car and sometimes light reflection. Manufacturers use these plastics because they're cheap and easy to install, but in the competitive market we have today, those cheap plastics can be on more knock on a list of negatives that steer someone away from a car in favor of another. So, Bill. Assuming you test drove this Camry, why did you buy it? ^^ Missed the point of the article and the comment. It's not just the "race car magazine" reviewers who have problems with perception. Throw in their friendly readers and forum posters. I don't know how many times I've read an angry post from someone saying that they hate Camry's... as if someone is forcing them to buy Camry's. I would rather eat doggy do do than drive a Camry! Boring ugly and slow. I don't wanna be lying on my death bed thinking ... Gee I wish I bought a Mustang GT. Oh well! too late now. Have some fun in your life, people. Don't live a dull boring life! Burn your Camry in public and denounce your boring life. Get a Muscle car, or a sports car, or a monster truck, or anything remotely interesting. As Neil Young once sang ... Better to burn out than just fade away. Yeah O.K. But a Camry! Surely there are a lot of csrs that are just as reliable and NOT boring! That's my point.